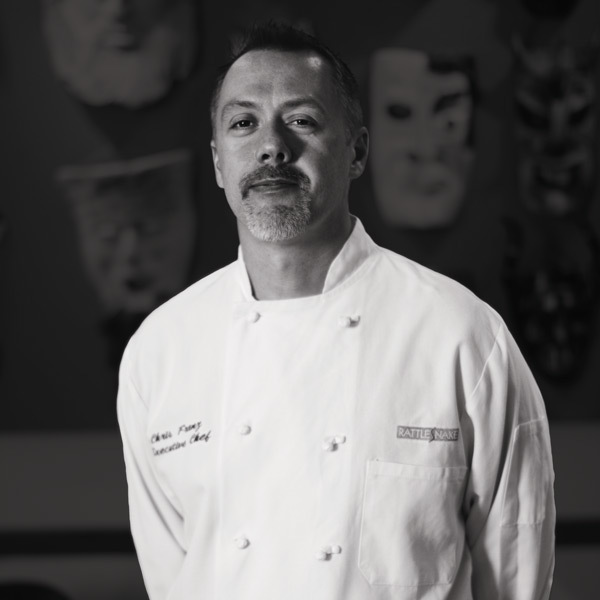 Chef Chris Franz joined The Rattlesnake Club in Detroit in 2001 after serving as executive chef at The Rattlesnake Club founder’s namesake bistro Jimmy’s in Grosse Pointe since 1998. He worked alongside renowned chef Jimmy Schmidt for over 10 years, creating and producing award-winning cuisine in Detroit, throughout the country, and around the world. His previous experience includes private clubs, beginning in 1992 where Franz served as executive chef and executive sous chef for Oak Pointe Country Club in Brighton and the Renaissance Club in Detroit and as executive chef at Forest Lake Country Club in Bloomfield Hills. After working up the ranks to sous chef at the Sterling Inn in Sterling Heights under chef Ray Hollingsworth, Franz earned his degree in culinary arts from Oakland Community College in 1991. He was also a silver medal-winning member of the Michigan Restaurant Association’s competitive culinary team. Franz resides in St. Clair Shores with his wife and three children.